You are a renowned paleobiologist who travels the world and evaluates recent discoveries. You recently were contracted to fly to Jakarta University and check in with one of their researchers. You eventually meet with the man, Sukarno, who claims to be on the verge of an incredible discovery. You ask him for details, but he tells you he believes that he is being watched and that someone is trying to steal and publish his findings before he does. Sukarno insists that all discussion about the case be done in code, lest his work for the past 47 years be robbed or trashed. With some consternation, you acquiesce to his demand, primarily because your trip to this island is all expenses paid. Sukarno guides you into a closed office with a desk and two chairs. On the desk are a pair of computers. Once you have both taken a seat, he hands you a sequence of six pictures with numbers scrawled in marker on them. You're pretty sure by this point that Sukarno is crazy and has not made a meaningful discovery. However, you are paid handsomely by the hour and are a bit of a cryptography enthusiast. As such, you're willing to take the time needed to solve this puzzle. Thankful that you have unrestricted internet access and that Sukarno can only see what you are doing on the shared document page, you begin your task. You start to ask him a question aloud before he scowls and shushes you. He quickly types: Do you want to risk Ruining Or Tarnishing 47 years of labor? Please stick to this code when communicating with me! Sukarno seems unwilling to disclose any additional clues, so you open a notepad document and carefully type out what it is you need to do. 1. Identify the cipher he insisted that I use, "Cipher A"
2. Use "Cipher A" to decode the message in the shared document. 3. Identify the cipher used on the pictures. What island were we on again and what was that about handwriting? Whatever it is, it is "Cipher B". 4. 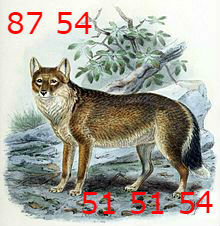 Use "Cipher B" to decode the numbers on the pictures. It looks like I get a letter and some numbers at the top. At the bottom, I usually get a three digit number except for the fifth one. I do not know how many digits the final picture requires. 5. Identify the animals in the pictures. 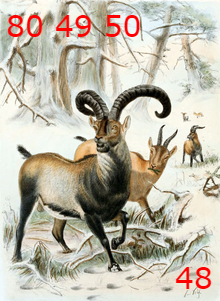 It looks like all of these were ripped from Wikipedia pages of extinct animals. 6. 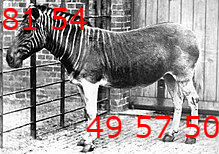 Figure out what the pattern is between the decoded numbers at the bottom of each picture. 7. Identify what the last number I need is. 8. Encrypt that number using "Cipher B". 9. Finally, since I can only talk to Sukarno on this shared doc, I need to encrypt both the *rule of the pattern (or even just identify what the number corresponds to)* and the *"Cipher B"-encrypted answer* using "Cipher A". From the bolded letters in Hint 1, he is using ROT-47 cipher ("Cipher A"). "This is how we will talk to each other whenever we are discussing the case. All of the numbers at the bottom of each picture go together. Everything on the pictures is encoded. I need you to figure out what number(s) belong at the bottom of the sixth picture and to identify the pattern I've found." The city of Jakarta, Indonesia is located on the island of Java. The programming language of the same name uses ASCII to identify character values. Therefore, the cipher used on the pictures is ASCII ("Cipher B"). 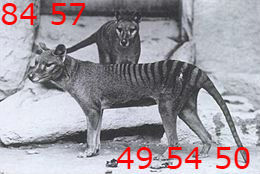 The numbers at the bottom of each picture are the numbers that are reached when you multiply each digit in the year of each animal's extinction. 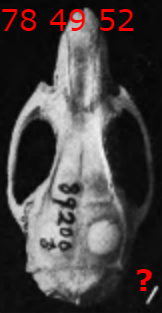 The last number you need is based off of the extinction year of the Nelson's rice rat, which is 1897. This is 1*8*9*7 = 504. 504 encrypted into ASCII is 53 48 52. This is a partial answer, as I figure out more I will update it. First letter of the animal's name. Everything after that at the top of the picture is how many letters are in the name. No symbols or spaces. This is how we will talk to each other whenever we are discussing the case. All of the numbers at the bottom of each picture go together. Everything on the pictures is encoded. I need you to figure out what number(s) belong at the bottom of the sixth picture and to identify the pattern I've found. #3 is from hint #3 - First letter of the animal's name. Everything after that at the top of the picture is how many letters are in the name. No symbols or spaces. Not the answer you're looking for? Browse other questions tagged cipher pattern knowledge or ask your own question.